Includes cut, shape, trim cuticle, hands massage, and your choice of polish. Regular Manicure with exfoliating and paraffin treatment of your hands. Includes toes nails cut, shape, clean cuticle, exfoliate with scrub, hot towel, and massage. Your choice of polish. Includes Regular Spa Pedicure and we use hot stones to massage your feet to relieve stress. 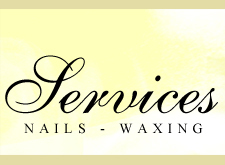 Includes Regular Spa Pedicure, special scrub, mask, and a paraffin treatment. Keep your natural nails beautiful with gel colors that stay on for 2 weeks.